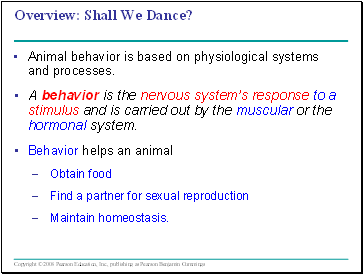 Animal behavior is based on physiological systems and processes. A behavior is the nervous system’s response to a stimulus and is carried out by the muscular or the hormonal system. An animal’s behavior is its response to external and internal stimuli. Ethology is the scientific study of animal behavior, particularly in natural environments. 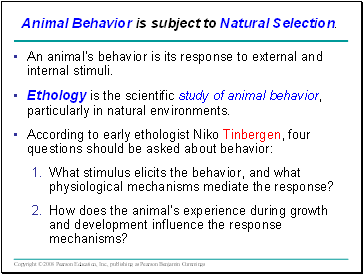 What stimulus elicits the behavior, and what physiological mechanisms mediate the response? How does the animal’s experience during growth and development influence the response mechanisms? Animal Behavior is subject to Natural Selection. 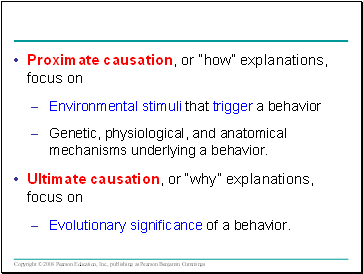 What is the behavior’s evolutionary history? These questions highlight the complementary nature of proximate and ultimate perspectives. 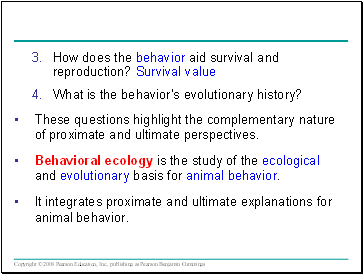 Behavioral ecology is the study of the ecological and evolutionary basis for animal behavior. It integrates proximate and ultimate explanations for animal behavior. Genetic, physiological, and anatomical mechanisms underlying a behavior. Evolutionary significance of a behavior. A fixed action pattern is a sequence of unlearned, innate behaviors that is unchangeable. Once initiated, it is usually carried to completion. A fixed action pattern is triggered by an external cue known as a sign stimulus. 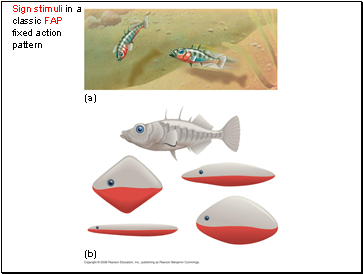 In male stickleback fish, the stimulus for attack behavior is the red underside of an intruder. 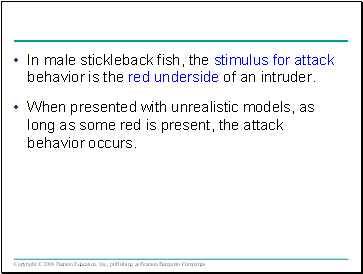 When presented with unrealistic models, as long as some red is present, the attack behavior occurs. 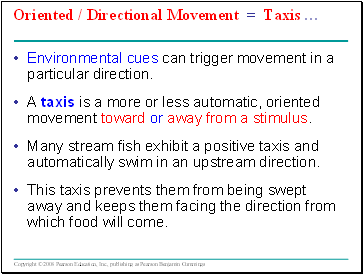 Environmental cues can trigger movement in a particular direction.